JDBC has long been offering support for DML statement batching. By default, all statements are sent one after the other, each one in a separate network round-trip. Batching allows us to send multiple statements in one-shot, saving unnecessary socket stream flushing. 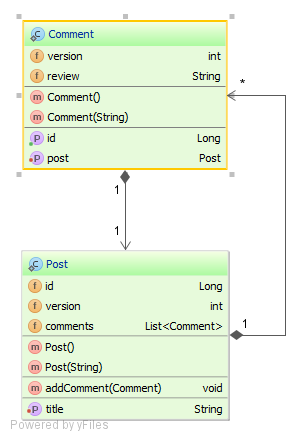 Hibernate hides the database statements behind a transactional write-behind abstraction layer. An intermediate layer allows us to hide the JDBC batching semantics from the persistence layer logic. This way, we can change the JDBC batching strategy without altering the data access code. Configuring Hibernate to support JDBC batching is not as easy as it should be, so I’m going to explain everything you need to do in order to make it work. A JDBC batch can target one table only, so every new DML statement targeting a different table ends up the current batch and initiates a new one. Mixing different table statements is therefore undesirable when using SQL batch processing. Set this property to true if your JDBC driver returns correct row counts from executeBatch(). It is usually safe to turn this option on. Hibernate will then use batched DML for automatically versioned data. Defaults to false. Now that we managed to configure Hibernate for JDBC batching, we can benchmark the performance gain of statement grouping. The more rows we INSERT or UPDATE, the more we can benefit from JDBC batching. For write-most applications (e.g enterprise enterprise batch processors), we should definitely enable JDBC batching as the performance benefits might be staggering. How about session.saveOrUpdate(entity).it can be used for common service right? Yes. It does the same thing as persist, but you should favor the latter. Is it possible to use JDBC Batching on Criteria Updates as well? From what I can see it only works for whole Entities. CriteriaUpdate is for bulk processing which is an alternative to JDBC batching. Usually, you use either one or the other, but you don’t combine them. What I am trying to achieve is to update in a batch where update statements are a group as shown above in the example (to reduce database round trips). You can find the answer in my High-Performance Java Persistence book. Enjoy reading it! Thanks. Purchased book from Amazon. Please provide some hint, what to study exactly or how to approach this problem. Need to solve this urgently before tomorrow. Really facing performance bottleneck in the application. My application needs to update 100 million records. Any help/hint is really appreciable. It’s explained in the Batching chapter why it does not work for MySQL, and there’s a solution in the jOOQ chapter which can be implemented fine even without jOOQ. Hey, you are flushing at batchSize + 1, because you persist before do the test . Thanks for spotting it out. The flush if branch should be the first one in the loop. I changed the code accordingly.